This whole post makes me itchy. “Because they hop,” I said, hoping my daughter wouldn’t notice that I hadn’t really answered her question. “Because they don’t have wings?” I said, cringing a bit because I knew where this was going. My best guess is that fleas don’t need wings for their lifecycle, so they lost them as an unnecessary use of resources. However, the article below seems to suggest that some wing parts got reused to give fleas their exceptional jumping ability. Thanks for the link. 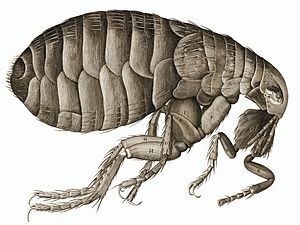 I’m sure it won’t surprise you one bit that on hearing that fleas have “retained several evolutionary features of flight” my daughter’s first question was “When did fleas have wings?” Most likely I’m at fault for oversimplifying that particular string of words when I translated this article for her. I’m still working out the bugs in my “Translate To Preschooler” module. I expect it will work perfectly once she’s a teenager. And how cool is it that this study of how fleas jump may change the way robots of the future move?